Architects are the first port of call for anyone looking to build a new property or renovate an existing one. Our homes are becoming more and more important and requests to Architects are becoming increasingly diverse. Revolving library anyone?? Car port for 7?? Re-opening a medieval bread oven?? Open any Interior Design magazine and many of the properties featured have a working fireplace, with the trend for fires – either an open fire or multi fuel stove – appearing to be very much here to stay. 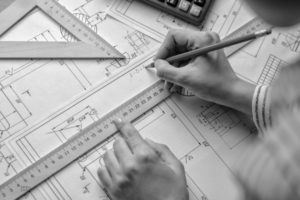 As a result of the varied demands of each scheme, it is not easy for a professional Architect to be an expert in every aspect of the project that they are asked to undertake. If a client requests an open fire, wood burning stove, boiler or alterations to an existing chimney or fireplace, that is where Turner Baker can help. We are able to offer various services to architects to ensure a timely, efficient and safe solution to all chimney, flue and fireplace requirements that meet with the direction of building regulations. Firstly, we are happy to offer CPD sessions to Architects with a comprehensive presentation on chimneys and flues that has been accredited by RIBA. The presentation covers design principles for both new build and renovation projects as well as a review of the different types of liners available. Our CPD seminars are given by Edward Turner, our chimney expert, who is able to enrich the presentation with his many years of experience. We have travelled to London, Bath, Dorset and York in 2016 and will be visiting some new practices in different locations in 2017. If you would prefer to let an expert design the chimneys on the plan for you, we can do that. We work with CAD and can provide professional quality designs with all of the dimensions required. This includes specifying flue and vent sizes. There are various clever flue and chimney systems available now that can be installed by the building contractor as part of the overall build project. We can supply the system and the expert advice and the building contractor on the project can install the product. This is especially useful where clients are looking for something with greater longevity than a stainless steel flue. We are able to work as part of a wider team on many of the projects that we are asked to advise on. This is particularly relevant for renovation projects where existing chimney stacks are being reopened, or altered to be incorporated into a new scheme. We have various lining solutions which lend themselves to heritage projects which need to be installed by a professional chimney company. Our teams have worked on projects from Devon up to Cheshire, in Wales and all over the South East. We are flexible in our approach and work hard to fit into the team and build schedules for each different project. Ultimately, we would like to work with architects to make sure that any chimneys and flues specified work correctly from the moment the project is completed. Sadly, all too often we get calls from homeowners who are excited to be in their new home but disappointed to find that a fireplace or flue doesn’t work properly. Solutions to this can often be found but at additional expense and upheaval to the homeowner. If you would like to speak to us about our chimney and flues services for architects, please contact us at info@turnerbaker.co.uk or call on 01432 839123.